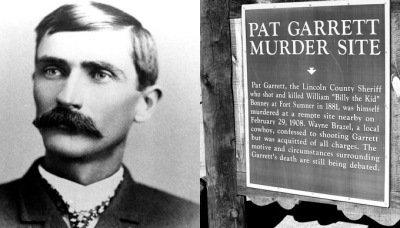 Patrick Floyd Jarvis "Pat" Garrett was an American Old West lawman, bartender and customs agent who became renowned for killing Billy the Kid. He was also the sheriff of Lincoln County, New Mexico as well as Doña Ana County, New Mexico. Born in Chambers Count y, Alabama on June 5, 1850, Patrick Floyd Jarvis Garrett was one of seven children born to John and Elizabeth Garrett. Three years later, Pat's father, John Garrett, purchased a Louisiana plantation in Claiborne Parish, where young Garrett grew up. A tall, thin, angular man with prominent cheek bones, Garrett left Louisiana for Dallas County, Texas at the age of 19. There, he worked on the large LS Ranch in West Texas as a cowboy and cattle gunman when rustling was rampant in the area. From there he joined up with W. Skelton Glenn, as a buffalo hunter. However, he soon got into a disagreement with a fellow hunter over some hides. The altercation soon led to gun play, and when the other man drew on Garrett, Pat shot him dead. By 1878, he had moved on to Fort Sumner, New Mexico just as the Lincoln County War was drawing to an end. The battle between rival gangs spawned a storm of lawlessness and violence which would continue in southeastern New Mexico for the next two decades. Garrett first went to work on Peter Maxwell's ranch. A year later he quit and worked as a bartender at a saloon called Beaver Smith’s. Soon after, he married a woman named Juanita Gutierrez, but she died before the end of the year. A little more than a year later, on January 14, 1880, he married Juanita’s sister Apolinaria. The two would have nine children over the years. 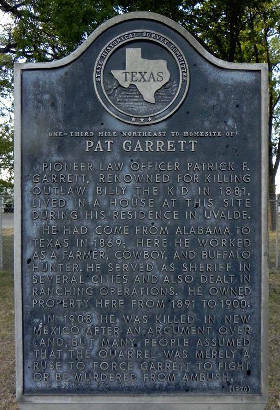 On November 7, 1880, Garrett was appointed as the Lincoln County Sheriff. Friends or not, his first vow was to bring the current reign of lawlessness to an end with the primary goal of apprehending Billy the Kid. 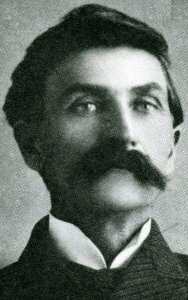 On December 15, 1880, Governor Wallace put a $500 reward on Billy's head and Pat Garrett began the relentless pursuit of the outlaw. Garrett set-up many traps and ambushes in an attempt to apprehend Billy, but the Kid seemed to have an animal instinct that warned him of danger. However, that was not to last. On December 19, 1880, Garrett confronted Billy and his gang when they rode into Fort Sumner, New Mexico. Killing Tom O'Folliard, the rest of the gang escaped. Soon, the determined Garrett and his posse tracked the outlaws down to Stinking Springs and surrounded the hideout. After a several day siege, the posse killed Charlie Bowdre and captured Billy the Kid, Dirty Dave Rudabaugh, Tom Pickett and Billy Wilson on December 23, 1880. Billy the Kid was tried and sentenced to hang in Lincoln, New Mexico on May 13, 1881. However, he escaped from jail on April 18, 1881, killing two guards in the process. Garrett went after the Kid once again and arrived at Peter Maxwell's ranch on July 14, 1881, to question him about Billy's whereabouts. As Maxwell and Garrett sat in Peter's darkened bedroom in Old Fort Sumner, Billy unexpectedly entered the room. The Kid didn't recognize Garrett in the poor lighting conditions and asked "¿Quien es? ¿Quien es?" (Spanish for "Who is it? Who is it? 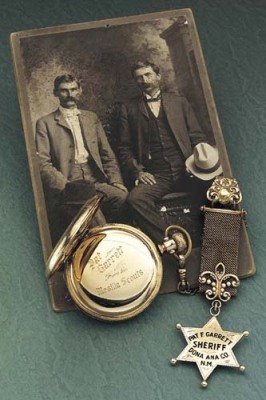 ), to which Garrett responded with two shots from his revolver, the first striking Billy's heart. Billy the Kid was buried in a plot in-between his dead friends Tom O'Folliard and Charlie Bowdre the next day at Fort Sumner's cemetery. Though the New Mexican newspaper said, "…Sheriff Garrett is the hero of the hour," most people in the area saw him as a villain for having killed a favorite son. Although he had put his life on the line for his community, he lost the next election for sheriff of Lincoln County. On February 29, 1908, Garrett and Adamson were in a buckboard bound for Las Cruces, where they would meet Brazel to close the deal. On the way, Brazel caught up with them, and as words grew heated, Adamson threatened to back out of the purchase. Afterward, Brazel rode on while Garrett and Adamson continued in the buckboard. Just miles outside of Las Cruces, they stopped the wagon and while Adamson was relieving himself off the back of the buckboard, three shots rang out. Pat Garrett lay dead. Adamson left his body in the desert and continued to Las Cruces. Once there, Adamson swore he never saw who shot Garrett and Brazel confessed to the shooting, claiming it was self-defense.